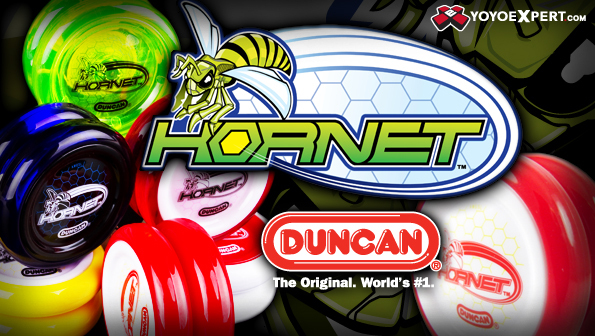 The Duncan Hornet is the first looping yoyo from Duncan Toys specifically designed for high-end competition play, and it's a huge leap forward for Duncan! The Hornet is a bearing looper designed with a better rim-to-center weight ratio making it a great choice for high-speed looping and wraps. Designed with input from Duncan Crew Worldwide, the Hornet is player-tested and competition-ready. The Hornet comes with two sets of spacers; aluminum for beginner/intermediate looping and plastic for more advanced competition play. As with most looping yo-yos, we do recommend using a thick lube on the bearing to keep a higher level of response.